[silverchair played] a minor support slot at the Vulcan Hotel in the Sydney suburb of Ultimo, with cartoon punks Nancy Vandal and the Popgun Assassins, on a Saturday night. The venue had a capacity of 150, but more than 500 fans tried to cram in for their short set. 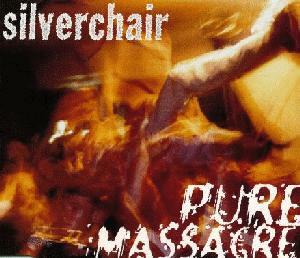 The cover for their second single, Pure Massacre, was photographed on this night, and gives a good indication of the chaos inside the overcrowded room. On a stage that was little more than a short platform, the band were besieged as the crowd moshed -- leaping around in time to the music with those around you -- enthusiastically. The hysteria was already starting to build around the group. And while it may have delighted the band (Daniel often praises what he perceives as quality moshing during a show) and worried their parents, it also impressed industry observers who could see that the band had more than one song, could already play well live and could hold an audience for an entire set.